In today’s world, this is considered very old news. Most of you know by now that Born Racer was released last week on Tuesday October 2. The website for the film says that it was to be released in theaters on that date, but other than the occasional IMAX Theater – I’m not sure how many theaters it actually has run in. Fortunately, it was released on DVD and digital that day as well. In case you don’t follow social media or check IndyCar.com very often; Born Racer is a documentary on Scott Dixon, who just won his fifth IndyCar championship last month. Anyway, at any other time of year I would have pre-ordered Born Racer and been one of the first ones to see it. However, I had a recent birthday and I didn’t dare order something when there was a good chance that Susan was going to get it for me. As I suspected, my diligent wife did in fact order it and we watched it the night of my birthday. So even though everyone else cranked out their reviews of Born Racer, you have to suffer through another one, because I just saw it a couple of nights ago. I’m old-fashioned with my technology. I prefer having a hard-copy DVD/Blu-ray that you can actually hold in your hand and watch wherever a player is hooked up. I don’t like digital copies or streaming as much as a DVD. I don’t like to have to depend on the internet to always be working, and the sound and picture quality is still just a little bit better on a Blu-ray than it is watching something on Netflix. That stance probably does not surprise many here. As far as the movie itself goes, I can say it was worth the wait. This wasn’t some half-baked attempt at splicing old footage together and calling it a Scott Dixon video. This was a professionally done feature film, and it shows. The production company was apparently given full access to Scott Dixon throughout the 2017 season. When I say full access, I don’t mean just at the track behind Dixon’s pit. They go behind the scenes in the Chip Ganassi Racing trailer for team meetings and into the Ganassi garage in the paddock. It doesn’t stop there. The cameras are running in the Dixon home, Scott and Emma’s bedroom (no, get your mind out of the gutter) and even into the bathroom as we get a shot of Scott Dixon shaving. While I’m probably making this sound like Reality TV, it’s not. It’s actually very tastefully done just to get a glimpse into the private life of one of the most successful drivers of our time. What we see is that even though the Dixon home is a lot nicer and more spacious than most of our homes, and Scott and Emma look like a picture-perfect Hollywood couple – they have a lot of the same day-to-day worries and concerns that most of us do, and then some. Most of us do not stand a significant chance of being seriously inured, or worse, while we are on the job. We get to know Scott Dixon, the husband; as well as Scott Dixon, the father. But who we really get to know is his wife – Emma Davies-Dixon. We get to see that their bond is not too different than what we see on television and on display at race tracks. We also see that without each other – their family does not work. I would say that Emma is given as much airtime as Scott, in the one hour and twenty-nine minute movie. But she is so intriguing in her thoughts, you don’t even mind it. One thing that I found so refreshing in Born Racer is that the topic of death is not avoided as if it doesn’t exist. There is a substantial segment in the second half of the film that goes into detail about the Dan Wheldon tragedy at Las Vegas in 2011. By detail, I don’t mean that they show various angles and get into graphic detail about what happened when Wheldon was fatally injured that day. Instead, it details the emotions that the different drivers went through in the aftermath. Emma also reveals that the day Wheldon died was the only time she has ever seen the normally stoic Scott cry. It’s a very sobering account that brought chills when I watched it. Emma also talks openly about the possibility of her own husband dying while racing. Scott reveals that they are open with their two young daughters, Poppy and Tilly, about how what he does for a living is very dangerous. Near the beginning, the film focuses on Dixon’s frightening crash during the 2017 Indianapolis 500. The fear on Poppy’s face is palpable as he enters the motor coach and she sees him for the first time after the crash. This is not a typical racing film, even for a documentary. The fact that death is discussed openly, makes it atypical on its own. But racing results are not the emphasis of this film. Yes it focuses on Dixon’s lone win of the 2017 season at Road America, and you also see the disappointment of losing the 2017 championship to Josef Newgarden at Sonoma. But this is not a film strictly about winning and losing. Instead, it dwells on the process of team goals and how much his Chip Ganassi Racing family has meant to him over the years. Interspersed throughout all of this are video clips of Dixon’s karting days in his native New Zealand back in 1988, when he was seven. There are sound-bites featuring his parents and his brother as they reflect on those days when he was excelling in a rich man’s sport on a middle-class income. The cinematography in Born Racer is second to none. There is no narrator or someone sitting across from the different interviewees asking questions. Instead, you mostly hear the voices of Scott Dixon, Emma Davies-Dixon, Chip Ganassi, Mike Hull, Dario Franchitti, Tony Kanaan and a few others that contributed their voices and thoughts to this film. The sounds are quite good also. If you have a good sound-system with your TV, crank up the volume. They did a good job of capturing and re-creating the sounds of racing. The music they play sparingly is excellent also, although there were a couple of head-scratching musical selections that didn’t quite seem to go with the vibe they seemed to want to create for some particular moments. Scott Dixon is sometimes criticized for being boring as a driver. Perhaps if you see this film you might have a better understanding of Scott Dixon, the man. You might learn that Scott Dixon is very methodical and even-keeled as a person, which serves him well in the cockpit of a race car. Without that persona that some interpret as “boring”, Dixon may not have amassed five IndyCar championships by the age of thirty-eight. I’ve always been a Scott Dixon fan. I may not cheer for him to win every single race just to keep things interesting, but I’ve always been a fan. I’ve been around long enough that I appreciate what I’m witnessing now with Scott Dixon. I’ve seen the likes of AJ Foyt, Mario Andretti, Al Unser and Rick Mears all race in their prime. Some may disagree, but I put Scott Dixon among those iconic names. And I would most associate his driving style with Rick Mears or Al Unser; because he is cool, calm and always in control behind the wheel. 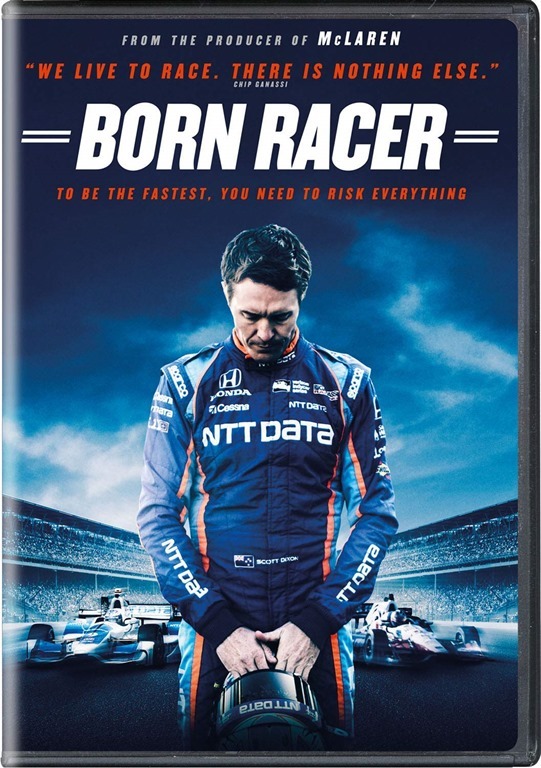 But if you have not always been a Scott Dixon fan, that will likely change once you watch Born Racer. Unlike many of famous drivers from the sixties and seventies, Dixon is as big a success as a family man as he is in a race car. Here is the official trailer for Born Racer. Born Racer is available for digital download and on DVD at Amazon.com. My only complaint? It is not available at this time on Blu-ray. If it ever is, I might buy the Blu-ray copy, because the cinematography is that good. If you want an early Christmas gift idea for a racing fan you now, Born Racer would be an excellent choice, and I highly recommend it. This entry was posted on October 12, 2018 at 4:04 am and is filed under IndyCar. You can follow any responses to this entry through the RSS 2.0 feed. You can leave a response, or trackback from your own site. Still waiting on Amazon to deliver my copy, not sure why it’s taking so long but I’m eager to watch it. Thanks for the review George. I hooked my iPhone to the TV and watched it the day it came out. I echo everything you said about this movie. Very, very well done documentary. I think the movie is one of the best I’ve seen. I think it gives the viewer a good introduction to the real Scott Dixon. I think Dixon is among the best of his generation. I don’t belive hes the gretest of all time! He pales in comparison to AJ, MARIO,because they won in every can of racecar and every kind of track , including dirt. Great movie! And yes I have seen them all from the late 50s thru today. I am sold! Just ordered on Amazon. Thanks, George et al.